The Thunderbird MAB to Outlook PST migration tool can efficiently convert contacts in Mozilla Address Book to Outlook. The software can export all types of address books found in Mozilla email client to PST format. One is the Personal address book saved in abook.mab, the other is history.mab that stores list of collected addresses. 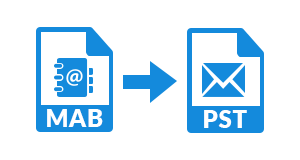 The MAB to PST conversion tool provides an option to upload multiple address book files. 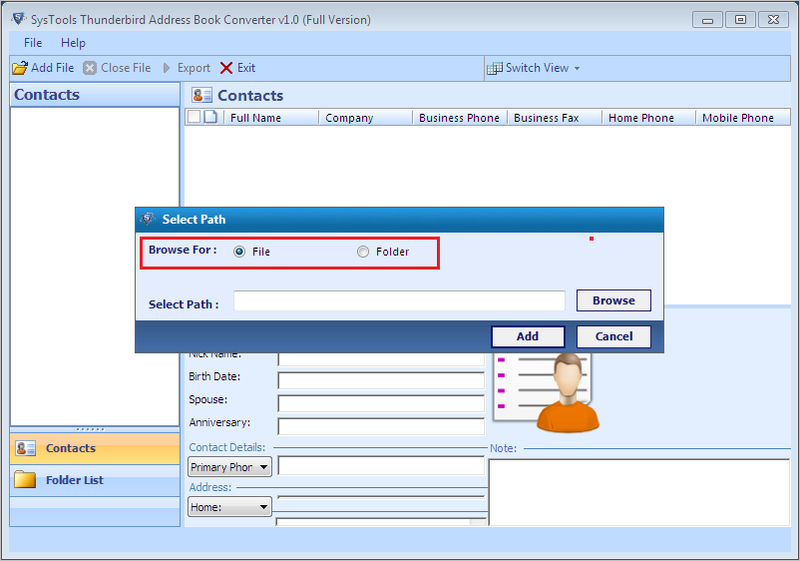 Export a folder with different contact books at a single time. This can be useful considering the three types of contact books available in the Thunderbird email client. They are abook.mab, history.mab and the third is impab.mab for any imported address book. 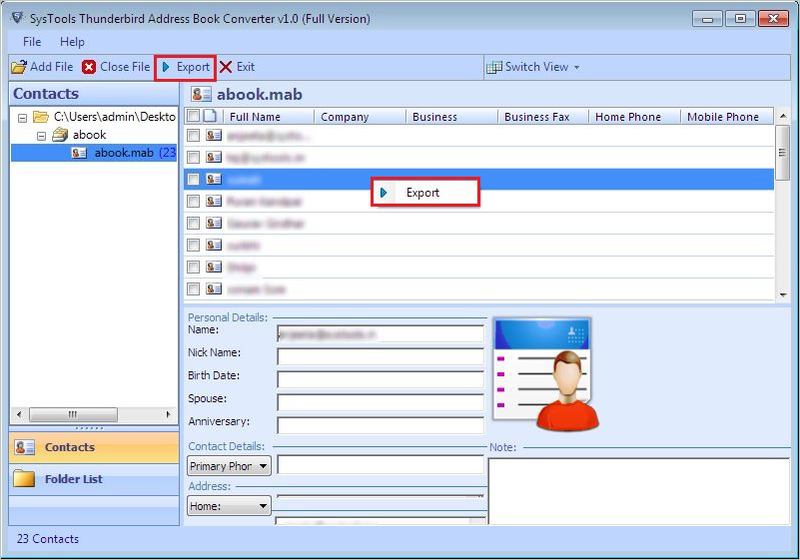 The MAB converter software has additional features of allowing a user to export in two different ways. Select between file and folder option. With just a single click one can choose to import a single Mozilla address book or multiple MAB files. The user-friendly interface allows making the decision in the beginning of the export process. This feature is active if selected the folder option for importing multiple MAB files. 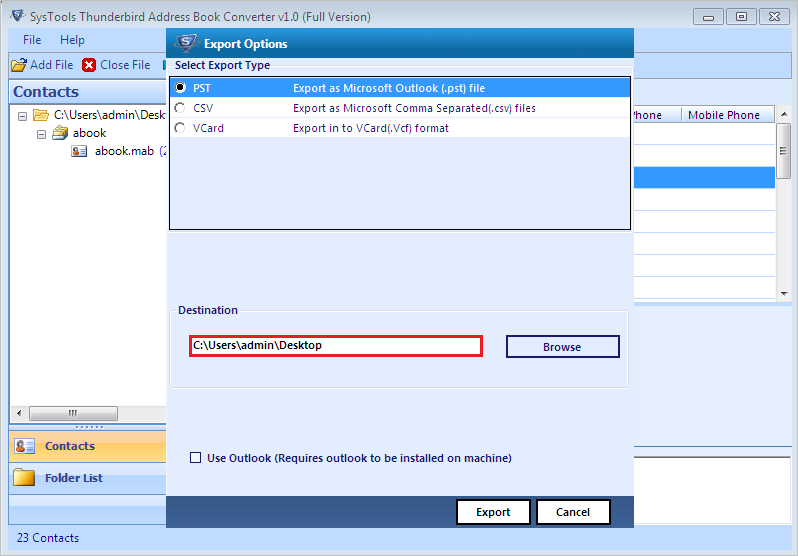 The .mab to Outlook migration tool can merge more than one contact book to .pst format. Just select the Mozilla address book files and save in Outlook PST format. 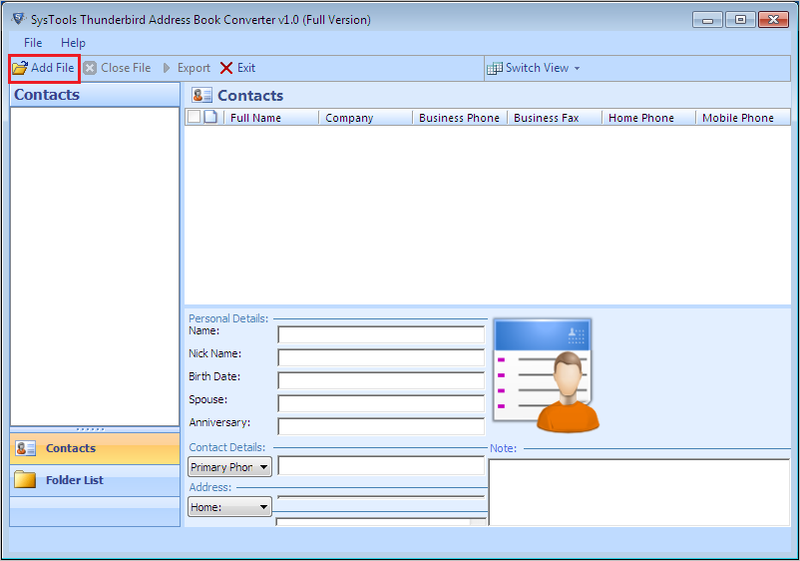 All the contact details saved in a single contact file like name, phone number, address, work details are also migrated. The .mab to .pst migration algorithm is a relevant tool that provides a detailed report on the export process. This report is available at the end of the conversion process in an Excel spreadsheet. 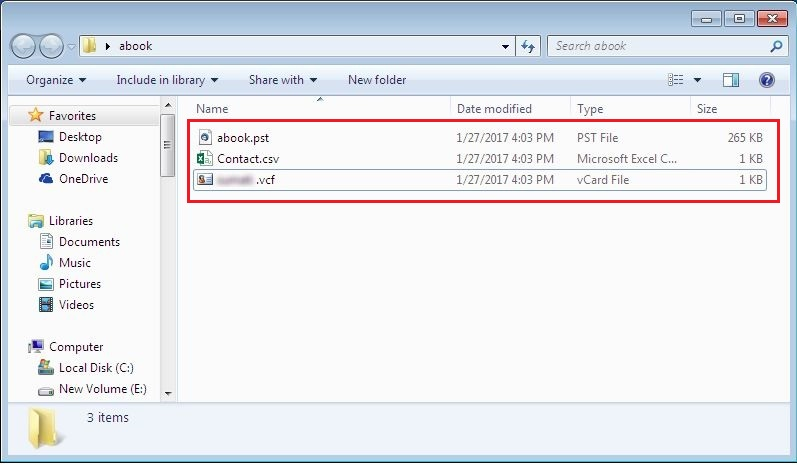 The file can be downloaded and saved in CSV format to folder path of choice. Refer to this report to know the details of migration process in future. The Mozilla Thunderbird to Outlook contacts converter is an easy-to-use tool that can work even without Outlook. Export contacts from Thunderbird to a .pst file in dual modes. Outlook is not specifically needed for conversion of address books. However, one may need Outlook application to verify whether the export process has been completed successfully. Is Thunderbird required to convert Mozilla Address Books to Outlook? No, Thunderbird is not a prerequisite to performing the conversion. Can a Corrupted contacts book be uploaded into the MAB converter software for repair? No, there is no provision for repairing a corrupt .mab file in this conversion tool. What Windows versions are supported by the migration tool? 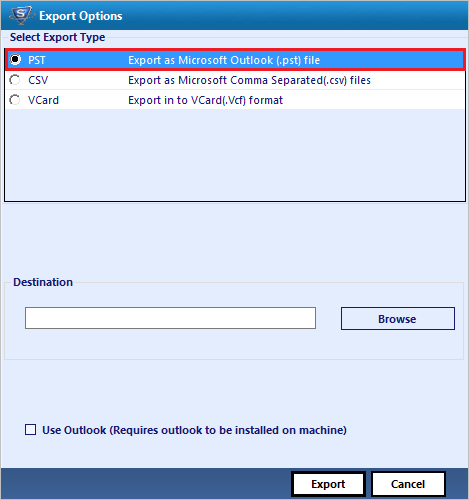 The MAB to Outlook PST export tool supports all versions of Windows(32 and 64-bit) including Windows 10. Is the Thunderbird to Outlook contacts converter free version devoid of malware? Yes, there are no malware, Trojans, or viruses present in the freeware MAB converter tool. Is there a file limitation for the .mab file to be uploaded into the tool? No, there is no limitation to the file size that can be uploaded into the software. Firstly, Download and Install the tool. Then, launch the program. The software window will look somewhat like follows and Next, click on Add File from the Navigation bar. File: Choosing this option will import a single .mab file into the converter software. Folder: This will upload a folder with multiple .mab files. Now, select the files needed for the conversion. Then, click on Export button from the navigation bar. A box will appear with Export Options. From here, select PST to start the Thunderbird contacts export to Outlook process. Next, set the Destination Path for the output .pst file. A Use Outlook can be checked if the system has already got the email client installed on the system. Having done that, click on the Export button. After the Thunderbird contacts export process has been completed, go to the folder location set in the previous step. This is to verify that the migration process has been completed efficiently. "This is a great tool provided by SoftwarePro! The old data agent had saved all the contact list in the personal address book. On migration to Outlook profile, I was unable to save the contacts in a to Outlook address book. Using this simple tool I was able to convert all my Mozilla Address book contacts to a .pst format. Thank you!" "This tool is indeed useful! I am not a very technical person. I was looking for a solution to merge my recently imported contacts. They were saved in impab.mab and I wanted to upload them to my personal address book. Thanks to this tool, I was able to successfully migrate my Thunderbird Address Book to Outlook Pst format in no time."